Sydney, a harbor city with rich attractions on land and sea. A city with a variety of marine-related attractions, start your honeymoon by taking a cruise to admire the prestigious Sydney Opera House and the world-renowned Sydney Harbour Bridge. Then, have a 360 panoramic view of the harbor city from the top of the Sydney Tower. Visit the Australian National Maritime Museum to experience an authentic submarine or SEA Life Aquarium to observe a rich aquatic display. Take a stroll or dip at Bondi Beach and enjoy fine food and beverages at the Darling Harbour. Diversity your holiday with non-marine related attractions. Stopover at the grand shopping mall Queen Victoria Building Shopping. Get to know the native wildlife, koalas and kangaroos at the popular Tauronga Zoo. Immerse into nature at the immaculate Royal Botanic Gardens or the well-preserved Blue Mountains for some fresh air. 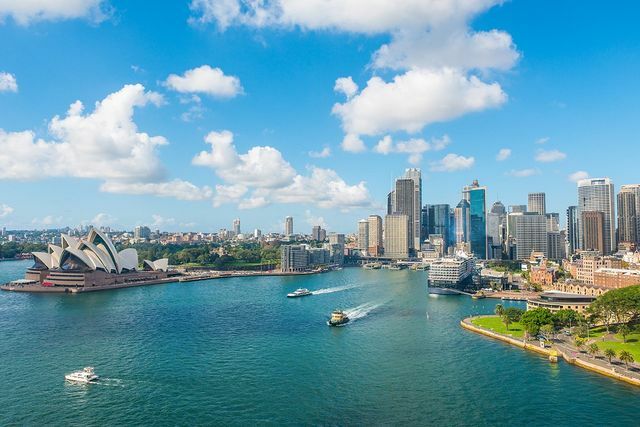 If Sydney sounds like the perfect honeymoon destination for you and your partner, read on to learn more about this amazing city. The best time to visit is from September to November. December to February is the high season with fewer or no discounts to grab. June to August is the low season with good discounts by some hotels and restaurants. Sydney Opera House: Built in the 20th century, it is an iconic architectural building and a UNESCO World Heritage Site. Sydney Harbour Bridge: The venue with annual firework display and visitors could participate to climb the bridge. Sydney Tower: Sydney’s tallest structure for a 360 view of the harbor city. Darling Harbour Waterfront: A pedestrian precinct that offers exquisite restaurants and entertainment with a view. Australian National Maritime Museum: A collection of indoor and outdoor maritime exhibits. Queen Victoria Building: A grand shopping complex housed in a 19th century building. Tauronga Zoo: A sprawling zoo with an assortment of wildlife from around the world and native Australia wildlife. SEA Life Aquarium: An extravagant collection of freshwater and marine aquatic life for display. Royal Botanic Gardens: Established in 1816, the stunning garden is a popular public space for events and festivals. Bondi Beach: A scenic beach that is extremely busy in the summer with a wide range of coastal activities to offer. Blue Mountains: An amazing getaway from the city for fresh air, splendid views and lovely bushwalks. Madame Tussaud's Sydney: More than 70 lifelike sculptures of world’s famous celebrities.